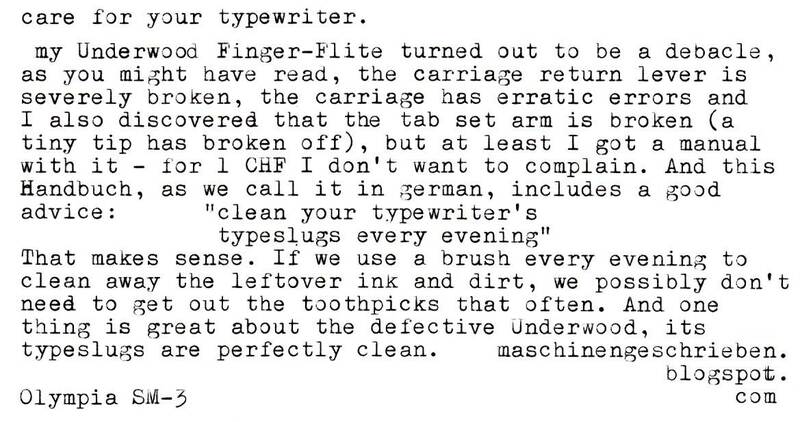 maschinengeschrieben: care for your typewriter. That is a great tip. It probably won't happen in my house, but it is nonetheless good advice. I just finished cleaning my Studio 44, he's got nice and shiny type slugs now. 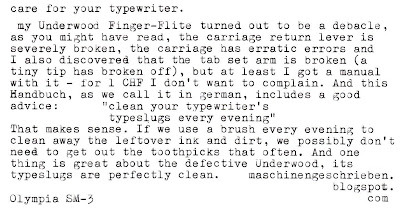 Never leave behind such a cheap typewriter -- at worst, it can provide hundreds and hundreds of useful parts! Am I the only one who thinks that, the more defects in a typewriter, the more character it has? That's a great advice! But I'm way to lazy to follow it. When I finish typing I just shove the typewriter back in its case... And that's why I find my self so many times using a toothpick instead of a brush.